In order to receive credit for a non-PSIA-AASI event, we request a written or e-mail request for approval of the event in advance. The request must provide us with details of what the event will entail and its duration. Eastern members may only attend one non-PSIA clinic for credit every 4 years (every other update). Complete the downloaded form and e-mail dharinga@psia-e.org, or fax to 518-452-6099, or mail to: Don Haringa, PSIA-AASI Eastern Division, 1-A Lincoln Ave, Albany, NY 12205. The OUTSIDE CREDIT POLICY allows members to count certain non PSIA-AASI functions for educational credit, contingent upon our approval, and a $50.00 administration fee. The purpose of this policy is to allow members who wish to broaden their base of experience to do so, while at the same time meet their continuing education requirements. Members must seek approval prior to attending such outside functions, so we can determine if the events qualify. This is necessary because there are such a variety of outside events available, and many do not qualify as equal to one of our functions. Both on and off-snow events will be considered. As a general guideline, an outside educational event must be at least 2 days long in order to be considered. Outside educational events may be counted for credit ONLY every other update. The “every other” rule also applies to PSIA-AASI Eastern Division “specialty” events such as Adaptive and Children, as well as “crossover” clinics (e.g. Alpine member taking a Nordic clinic and vice versa). 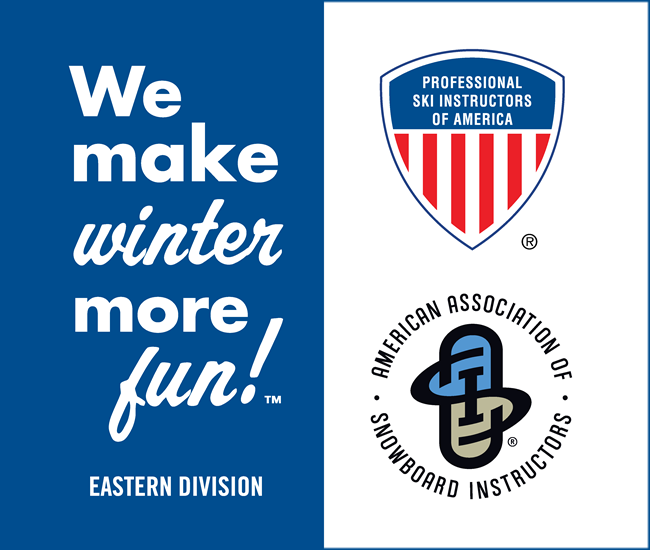 In summary, at least every other update has to be an event listed on the PSIA-AASI Eastern Division schedule of events, within the member’s primary discipline. We will not grant credit for attendance of events in a prior season. You do not have to use outside functions for credit and, in fact, the majority of our members who attend such functions do not. This is just an optional membership benefit that is available to you. Any scheduled, sanctioned event (at least two days) conducted by another division of PSIA-AASI, that would count as an update credit for their members. 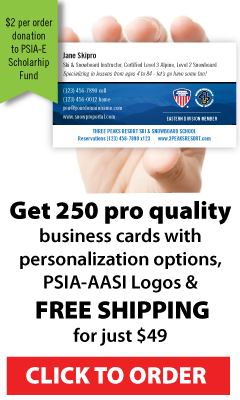 Major PSIA-AASI events; specifically, the National Academy. Any other event requires prior request/approval. Passing the highest level of certification in another country. Level 4 Canadian update events = credit for PSIA-AASI Level III. Level 3 Canadian update events = credit for PSIA-AASI Level II. Level 2 Canadian update events = credit for PSIA-AASI Level I.
USSA COACHES COURSES MUST HAVE PRIOR APPROVAL FOR EACH SPECIFIC COURSE AND REQUIRE AN ADMINISTRATIVE FEE. As a general guideline, an outside educational event must be at least 2 days long in order to be considered. THE USE OF ANY OTHER OUTSIDE EVENT AS A CREDIT WOULD REQUIRE A REQUEST BY YOU, AND APPROVAL BY US, PRIOR TO YOUR ATTENDANCE.